Luzer Twersky grew up speaking Yiddish in a Chassidic home in Boro Park but left that life behind as a young adult, cutting practically all ties with his family and community. 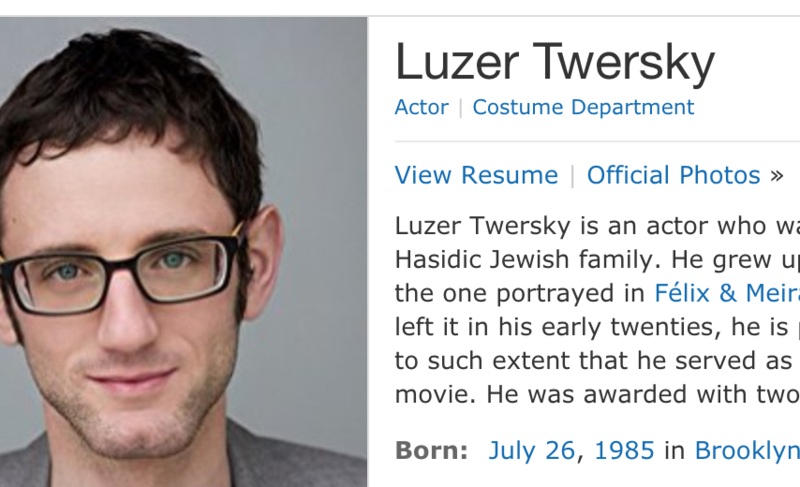 He now works as an actor in film, television, and theater, performing both in Yiddish- and English-speaking roles. Twersky appears as one of the three subjects of the documentary One of Us, recently released on Netflix, which chronicles his and two others' break from Chassidic life. Currently, he is performing on the Yiddish stage in New York in the role of Sam Feinschreiber in "Awake and Sing!" (Yiddish title: "Vakh Oyf Un Zing"), written by Clifford Odets and translated into Yiddish by Chaver Paver. The play is being presented by the New Yiddish Rep theater company at New York's 14th Street Y in Union Square, with performances Wednesday through Sunday until Dec 24. The show began with Adam Gruzman's "Israel Report", courtesy of the Forverts Sho on the web at yiddish.forward.com.